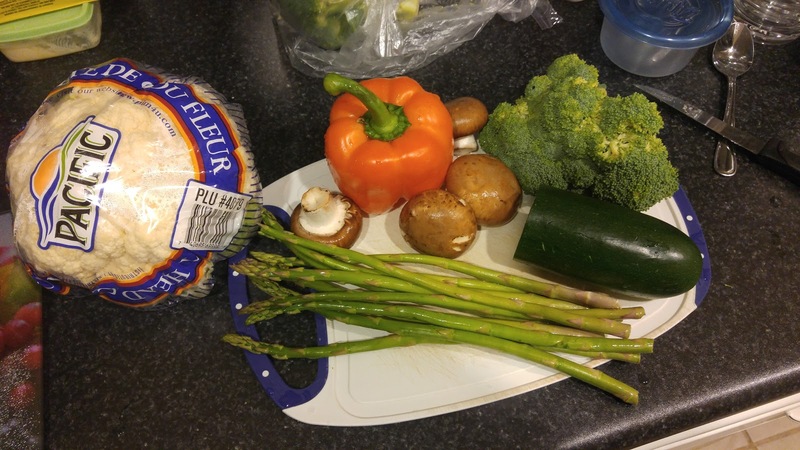 I switch up my veggies when making stir fry which is why I love it so much. You can have so many different textures and flavors, depending on what you use. Chop four cups of your choice of veggies into bit size pieces. Preheat the pan to medium-high heat and slice the red onions by cutting an onion in half, lengthwise, and slicing into wedges. Heat two tablespoons of oil in a pot or large pan and add the onions; separate them a bit with your hands as you add. At the same time add 1-2 tablespoons of garlic (or 2-3 cloves) and 1T grated fresh ginger. Cook for 2 minutes. 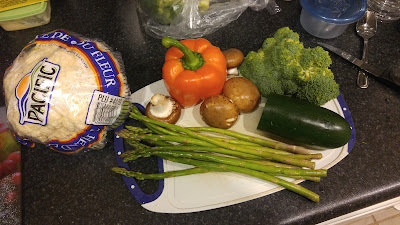 Add your chopped veggies and add 1/3 c. of broth to help steam the veggies. 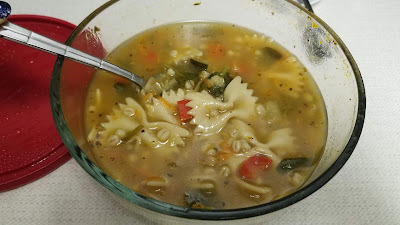 *Water will work but broth provides more flavor* Cook for 5 minutes stirring often. While this is cooking, prepare the sauce in a a small jar or other container that seals. Shake until the cornstarch is mixed well. Pour over your stir fry when it has approximately two minutes left of cooking so the cornstarch has time to cook and thicken properly. * If you are using meat - cook it first, take out of the pan, follow the above directions and then add it to the pot/pan with the sauce. I use tofu and add it in just before the sauce. * If you are using noodles in your stir fry - follow the directions on the package. I add egg noodles/chow mein noodles right at the beginning with the veggies and use 1/4-1/3 c more broth or water. 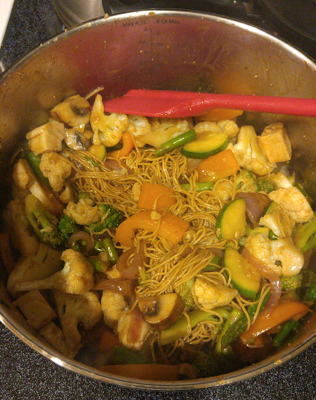 I used udon noodles last night and added them about halfway through the veggie cooking time. Remember that everything is trial and error. I use recipes more as guidelines and make it my own. I hope you enjoy this as much as I do!